With all the gorgeous weather we've been having I took it upon myself to open some windows and put in our window fans a few days ago, so it goes without saying that this cold snap is my fault, and is mother nature's revenge for my audacity. Between the cold, and my stubbornness about not closing the windows and turning the heat back on I haven't done too much other than throw temper tantrums about misbehaving projects. Instead, lets take a look at an old project that's somewhat completed (for now at least). When we bought the house we had passed off the 1st floor bath as a modern addition, as it was one of two rooms with drywall, and was a vinyl monstrosity (albeit a small one), and was carved from space stolen from both the dining room and front parlor (we could see traces of the coved and stenciled ceiling when we tore down the drop ceiling to work on plumbing, sadly I can't find those pictures, and the ceiling has already been patched). At the same time, it had a working toilet and shower (some of the only working plumbing in the house), which made it possible to hole up in a few rooms on the first floor while we tackled the rest of the house. 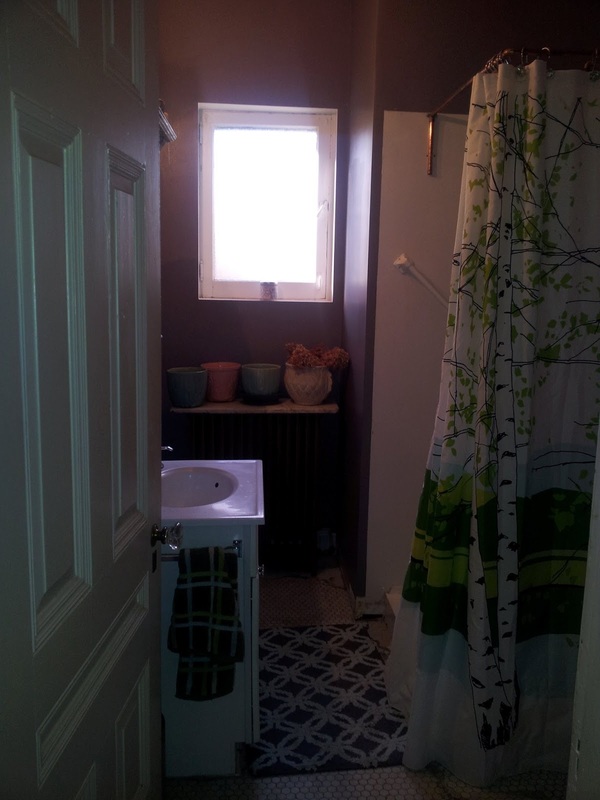 We had asked the heirs that were selling the house if there had been anything of note to the bathroom before they remodeled it, to which they said no. So imagine my surprise when the pink toilet failed a few months ago (the pink toilet was installed used by the people selling the house), and in the process of replacing it I found a surprise under the rotting sheet vinyl under the toilet. Umm, hello hex tile. What are you doing in my cheap 90's bathroom? Needless to say the vinyl came up (or is still coming up actually, we haven't pulled out the vanity yet). Came up may be a generous term though, as they used concrete floor leveler over the top of it - luckily hex tile's pretty indestructible and nonporous, so it hasn't minded my hammer and chisel. 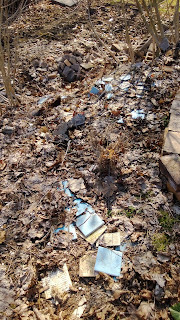 Sadly, it turns out that a good portion of the floor happens to be in the backyard. For some reason they removed chunks of the hex tile (and the six inches of mortar it sat in) and chucked them in the backyard - funnily enough I was using the chunks of concrete (the pieces were upside down) as places to sit while I dug up a bathrooms' worth of baby blue, yellow and black tiles from Mt. Trashmore in the backyard (I assume they came from this bathroom, hence the newly sheetrocked walls, however I just started finding original subway tiles in the pit, so who knows?). Had I bothered to turn over any of those pieces I would have ripped up the bathroom long before I did looking for their origin . . . 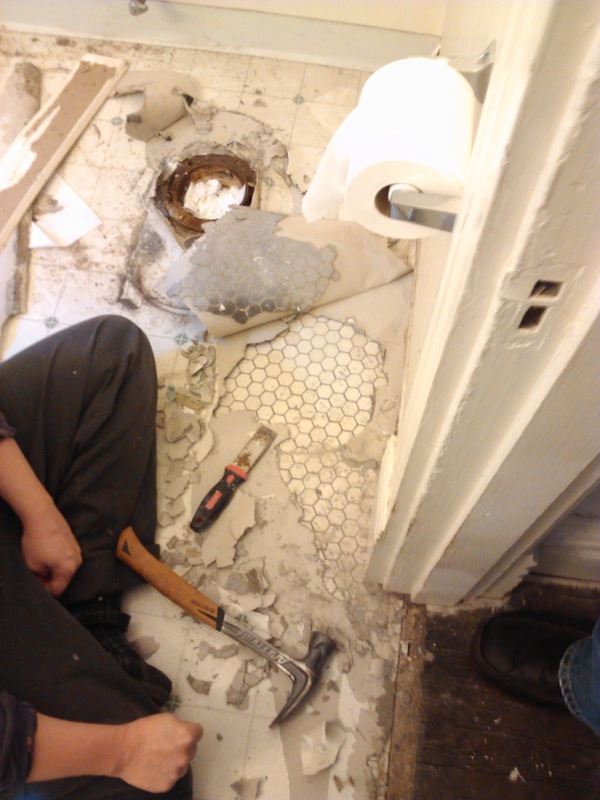 Even though I knew I could grind out the concrete that had been used to level the floor and retile those sections, the plan is to eventually rip out this side of the bathroom and return it to the parlor. Instead, I got busy with the sharpies . . .
That's right, I drew hex tiles. 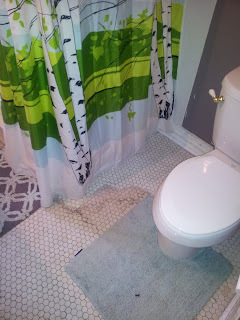 First I scrubbed the concrete, then matched a white floor paint to the hex tile, then bought five gray and silver sharpies and went to town. It took a disgusting amount of time, and there's a good chance I could have retiled it more quickly - things to keep in mind next time you want to draw your floor . . . I sealed it with clear polyacrylic, and it has held up well (obviously no one's walking back in that corner). 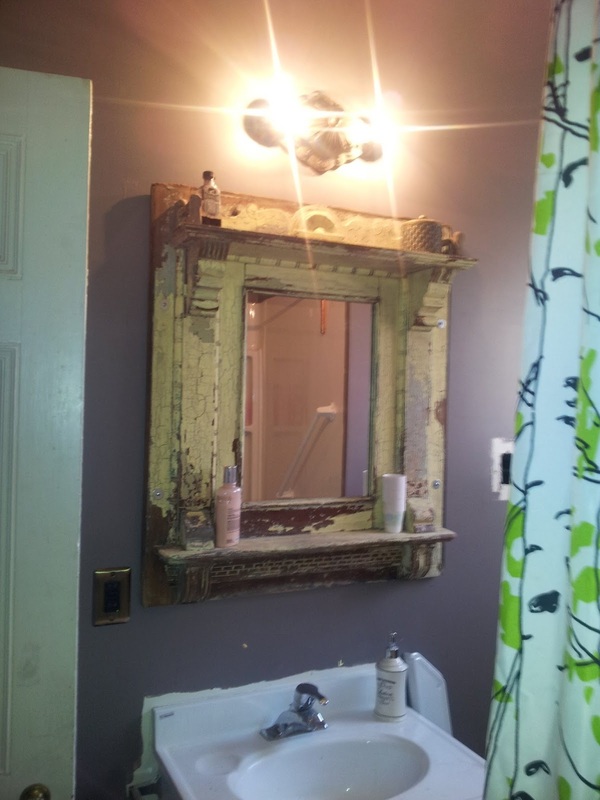 Here's where we're at today - the mirror is a story in and of itself, so I'll save that for another day! I love that you patched with a sharpie! I have a love hate relationship with my hex tile. 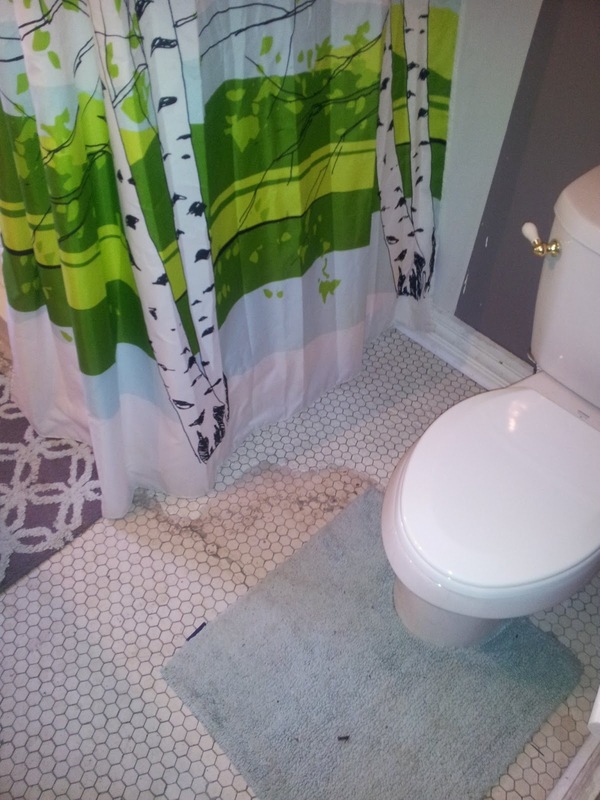 We put it in ( it replaced structural carpet and rotted wood) but it is a pain to keep thegrout clean. 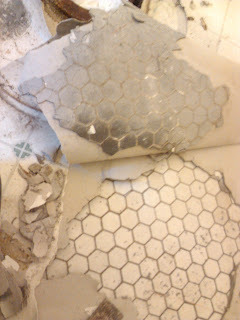 Our old grout is hopelessly dark, so in a way it's easy to clean, but I can't keep the new hex tile clean . . . and yes, structural carpet, we *may* have ripped out some of that!